Germany. Brandenburg-Franconia. Kasimir and Georg, AD 1515 to 1527. Goldgulden. AD 1517. Kasimir von Bayreuth and Georg von Ansbach, ruled Brandenburg in Franken 1515-1527. 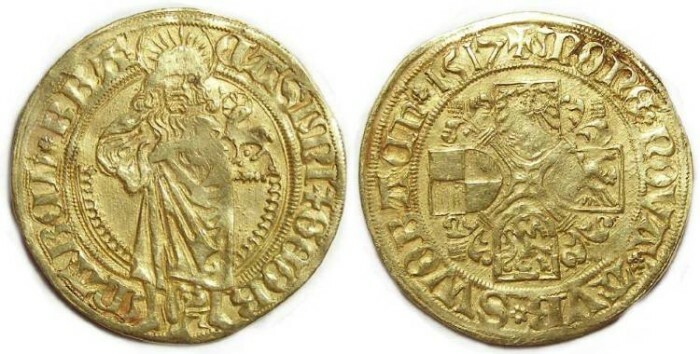 Their goldguldens appear to be much rare than those of the previous two reigns as there is only one example in coin archives for them but dozens for the previous two reigns. Denomination : goldgulden. Mint : Schwabach. Size : 22.5 x 22.9 mm. Weight : 3.22 grams. Reverse : Four heraldic shields in the angles of a flower cross, with MONVE NOVA AVR SWOBACh 1517 around.